Comtest Wireless provides active and passive test and measurement solutions for GSM-R telecommunications networks and ETCS signalling systems. Comtest Wireless are independent experts in the field of GSM-R testing and ERTMS testing solutions. Comtest Wireless active and passive GSMR and ERTMS monitoring solutions collect data from multiple equipment types, sources and vendors. This combined view makes it easier to analyse and identify communication issues and then make better decisions. That’s why the unique solutions from Comtest Wireless are used by vendors and operators of GSM-R and ETCS communication systems and technology around the globe. See how to save time and money with Comtest Wireless NetProbe Combined rail telecoms and signalling network performance monitoring. Our NetProbe Combined solution collects data from different equipment using monitoring on-board the train and along the track. This makes it easier for rail operators to check the quality of service, for interference issues, and in areas with poor coverage. Learn more. Comtest Wireless speaker Luca Fornasiero, will be presenting on “Using data from multiple sources to support and enhance ERTMS delivery”. His talk will cover: the importance of data in troubleshooting and predictive maintenance, functional analysis & ERTMS, and Cyber security considerations. This troubleshooting guide is in the form of a white paper. On 10 May 2018, Mark Carne, Chief Executive of Network Rail, said …. This troubleshooting guide examines 3 key challenges faced by those responsible for ERTMS systems performance and operations and then proposes ‘what good looks like’ to mitigate them. Improve operational efficiency - start, stop and reconfigure GSM-R tests on-board trains and wayside – all from the comfort of your own desk! NetProbe Unattended Remote Configurator is the next generation in unattended rail telecoms testing solutions. Start, stop and reconfigure GSM-R tests on-board trains and wayside without having to attend in person. It saves time and money! 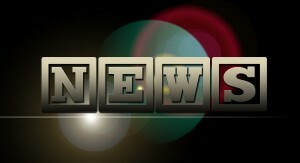 Comtest Wireless entered the UKRIA awards for the first time this year. 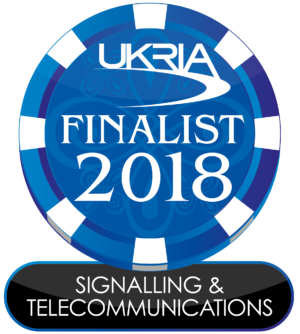 NetProbe Analytics, the powerful software platform for troubleshooting GSM-R and signalling issues, has been shortlisted for the Signalling and Telecoms category. 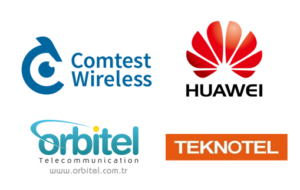 Comtest Wireless, independent experts in the field of GSM-R and ERTMS test and monitoring solutions, announce that its NetProbe Drive Test solution has been instrumental in enabling Huawei to gain acceptance for the new KSC line by Turkish State Rail Operator, TCDD and Teknotel Enerji Telekomünikasyon A.Ş. NetProbe OBU (On Board Unit) enables train operators and rail infrastructure providers to have greater visibility of the performance of ERTMS systems and other operational assets. 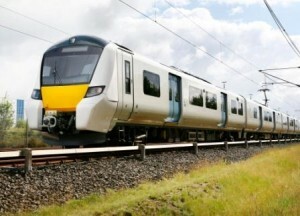 Test trains can be expensive to move to different locations and are not easy to run during peak times. That’s why there can be significant advantages to installing ERTMS monitoring systems onboard operational trains. 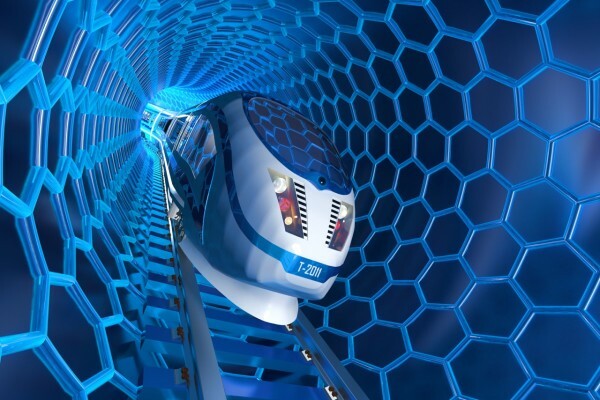 This is a significant milestone for the European rail industry, not just for Comtest Wireless. New NetProbe Cloud web browser solution makes it easy to monitor call drops, handover failures and other GSM-R testing KPIs, 24/7. 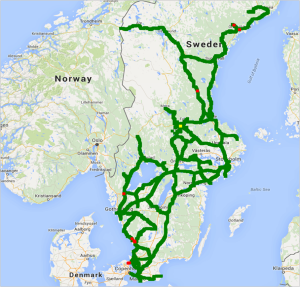 One of the first organisations to adopt the new NetProbe Cloud solution are Norwegian railway infrastructure manager, BaneNOR (previously Jernbaneverket), who wanted to extend their capabilities by making selected data and reports available online, as well as from dedicated computers in the Head Office. 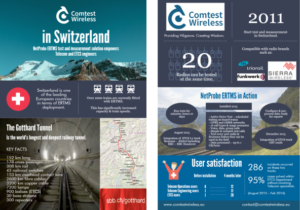 Comtest Wireless has produced an infographic to showcase the use of its active drive test solution in Switzerland. It uses facts and stats to demonstrate how the Comtest Wireless drive-test solution has been used in Switzerland, since it was first introduced in 2011. Thanks to SBB CFF FFS (Swiss Federal Railways) who allowed us to showcase the part we have played in the Gotthard Tunnel developments as an infographic. Comtest Wireless adds ‘installation’ to its certification scope and is accredited by RINA as complying with the latest ISO 9001 (2015) standard for quality systems. 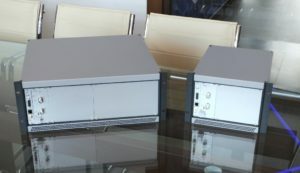 “Quality is an important value for Comtest Wireless – we believe in developing and delivering quality products and services which in, turn help our customers to test and monitor the quality of the GSM-R and ERTMS networks on which they rely. Comtest Wireless rises to rail market demand for real-time, network-wide insight into GSM-R quality and interference problems with new NetProbe Automatic solution. 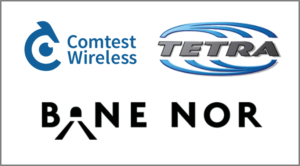 Comtest Wireless announce the launch of an unattended, automated drive-test solution. With NetProbe Automatic, it’s easy for rail infrastructure operators to install the appliances themselves and it’s affordable to do so on as many trains as they like. 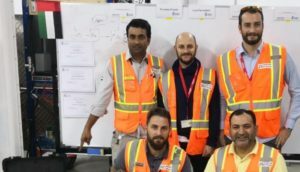 This means they can continuously monitor the telecoms network performance, from on-board test, operational or freight trains – using a robust and reliable solution. Read more. 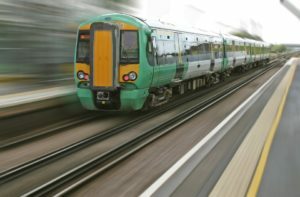 Thameslink Programme inspires development of new portable unattended active GSM-R and ETCS test systems. The new NetProbe Portable range will enable rail and signalling operators to extensively measure the GSM-R and ERTMS networks for voice and data quality by setting up and running automatic tests. 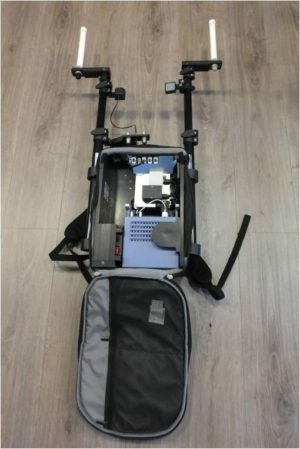 The solutions will be available as a carry-on battery powered trolleys and backpacks, which can be used on board trains or secured trackside, such as on a platform. Comtest Wireless offers solution to address GSM-R interference challenges (without a hiring a battalion of radio engineers). 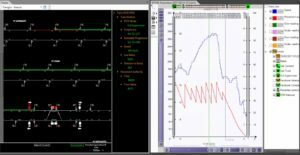 A typical solution gives customers a toolkit that enables them to identify interference ‘hotspots’ using GSM-R performance data collection and analysis equipment installed on board operational trains. The systems can perform tests with every GSM-R modem currently available in the market, making it easy to continuously signal levels (ie forcing UMTS 900) and therefore identify active operators and technologies. Read more. 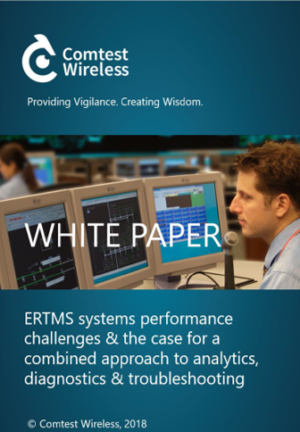 Discover how the GSM-R and ERTMS test and monitoring solutions make a difference. Whether you are a telecom vendor, signalling vendor, railway infrastructure or rolling stock operator, Comtest Wireless solutions can help you detect issuse with GSM-R telecomms and ERTMS signalling networks. 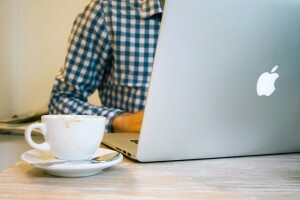 Talk to us about what you need and we’ll arrange an initial webinar or meeting to show you how. 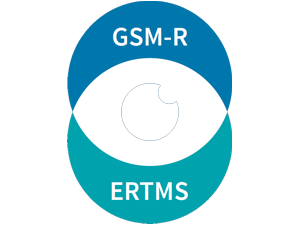 We'll make sure you are kept up to date with what's happening in the world of GSMR testing and ERTMS testing. 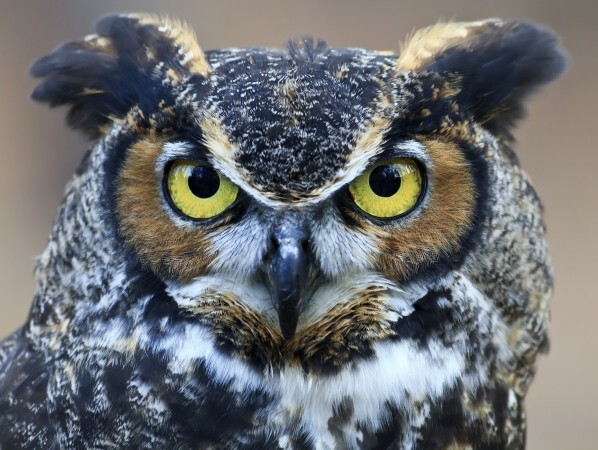 We promise not to bombard your inbox every week. 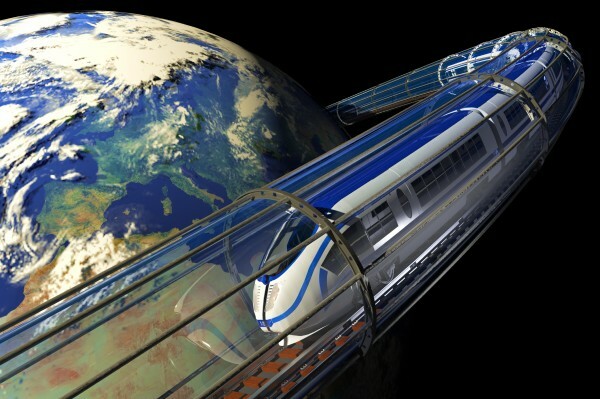 Success based on being able to fulfil the ERTMS passive monitoring tender requirements to the highest degree. Comtest Wireless, independent experts in the field of GSM-R and ERTMS network test and monitoring solutions, announces that its exclusive UK partner has been chosen to provide active ERTMS testing solutions for the Thameslink programme. Based in Henley on Thames, Henley Squash Club is run entirely by its members. Henley Squash club member David Wright, became the Welsh Open Squash Masters Over 60s at the Welsh National Sports Centre on December 4th-6th.